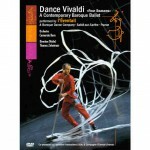 Dance Vivaldi: A Contemporary Baroque Ballet infuses traditional French Baroque dance with modern concepts. Set to Vivaldi’s Four Seasons, this recorded live performance dissolves the boundaries between past and present. Blending a historically delicate technique with the vibrant motion of contemporary dance vocabulary, the dancers create a unique expression both traditional and new. Dance Vivaldi: A Contemporary Baroque Ballet depicts a performance style not usually seen by the American public. It was created by Marie-Geneviève Massé, a French choreographer with an intimate depth of understanding of this music and dance vocabulary. With her mastery of the Baroque movement vocabulary, she infuses this work with perfectly balanced modernity. 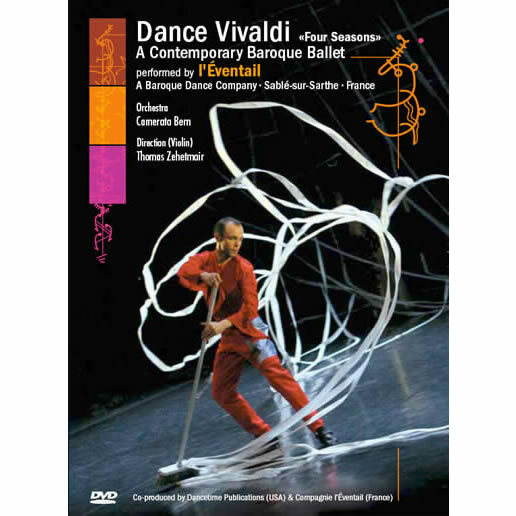 This video is a 40 minute recording of a performance by the French Eventail Company (Compagnie l’Eventail). Music, costume, dance, and imagery combine to create a spectacular “contemporary baroque” performance that builds a new movement from a traditional foundation. 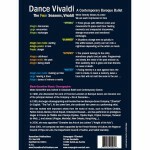 Innovative concepts and phrasing of the dance are in perfect concert with the musical imagery of Vivaldi’s Four Seasons. In sensitive synchronization, the dancers’ movements reflect musical themes; visual poetry mirrors the aural experience. After training in classical ballet, Marie Geneviève studied modern dance with Aaron Osborne, Sarah Sugihara and Françoise Dupuy. In 1980, she discovered Francine Lancelot’s work of on baroque dance; entranced, she became one of the lead dancers of France’s renowned baroque dance company, Ris et Danceries. In 1985, she started to choreograph and founded her own company, l ’Eventail. She has worked with many internationally known musicians, such as William Christie, Patrick Cohen Akenine, Giovanni Antonini, Peter Zajicek, Hervé Niquet, and Christophe Rousset. In 2000 she was appointed Knight of the Arts and Letters (Chevalier des Arts et des Lettres), an honor the French government bestows on those who have distinguished themselves in the artistic and literary fields. Three groups with different colors and movements fill space and time: fleeting moments and unexpected discoveries, strange encounters and emotional exchanges. Situations change ever so quickly. In this willful season, poetry can turn into a nightmare depending on the action or mood. The present belongs to the child, sometimes playful and yet calm. Progressively and slowly, the mists of the past enclose us. Then suddenly, time is gone and man thumbs his nose at death. April 7, 2006 at the Cultural Center in Sablé sur Sarthe./ 7 avril 2006 au Centre Culturel de Sablé sur Sarthe.